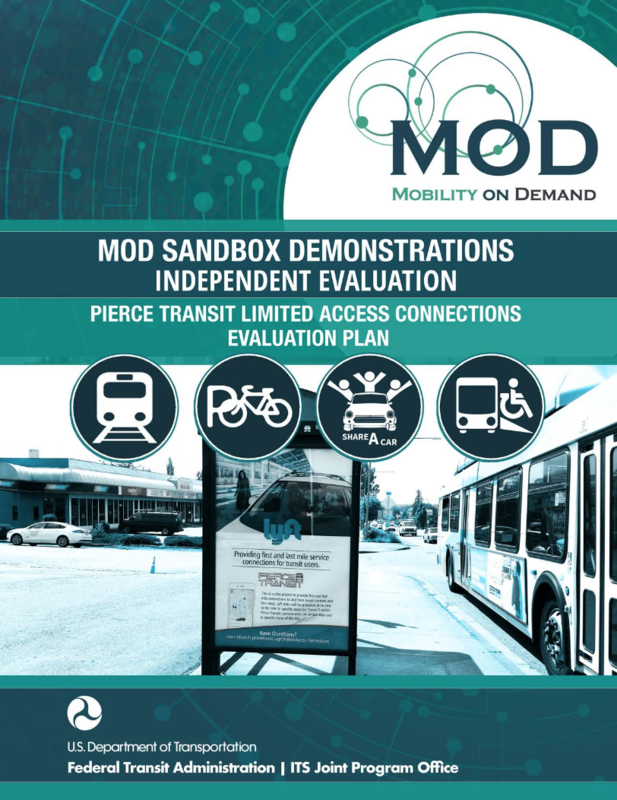 *The MOD Sandbox Demonstrations are sponsored by the Federal Transit Administration (FTA). 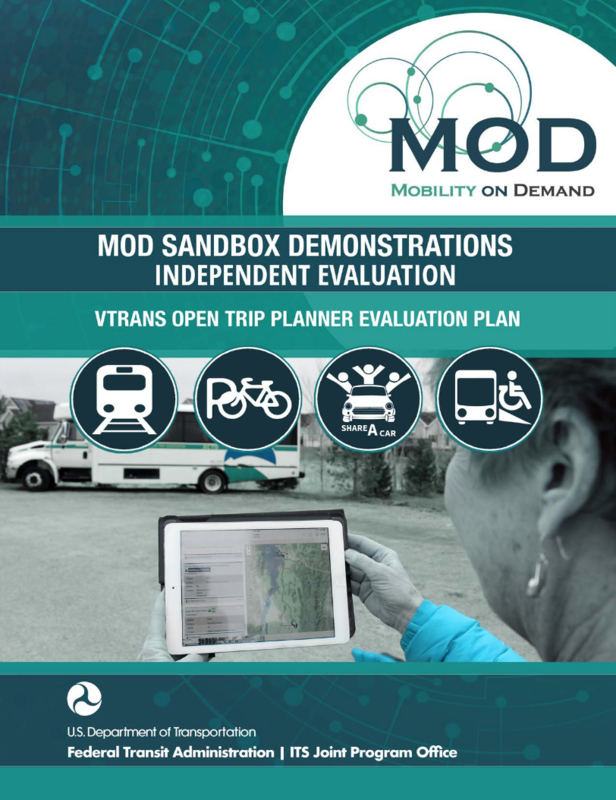 The MOD Sandbox Demonstrations Independent Evaluation is sponsored by the United States Department of Transportation (USDOT), jointly by the Intelligent Transportation Systems – Joint Program Office (ITS JPO) and the FTA. All documents are USDOT publications. 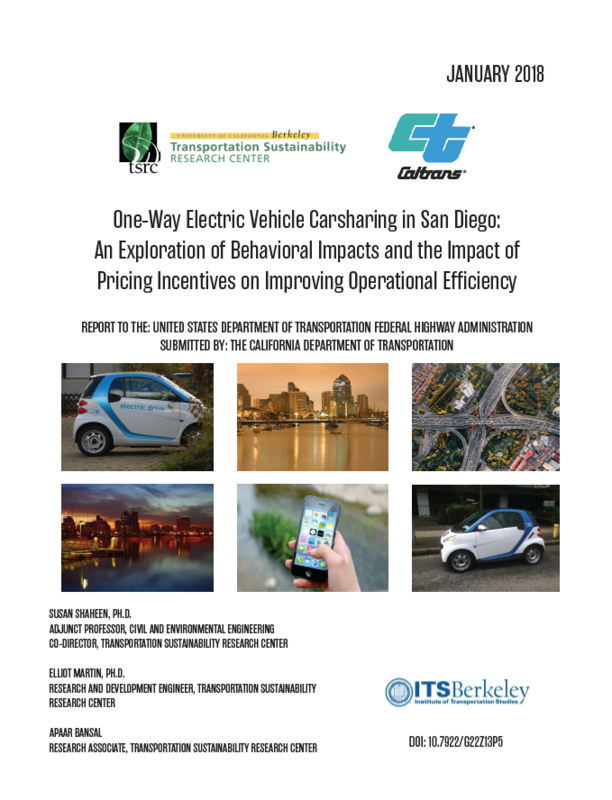 Read “One-Way Electric Vehicle Carsharing in San Diego: An Exploration of the Behavioral Impacts of Pricing Incentives on Operational Efficiency” by Susan Shaheen, Ph.D., Elliot Martin, Ph.D., and Apsaar Bansal. 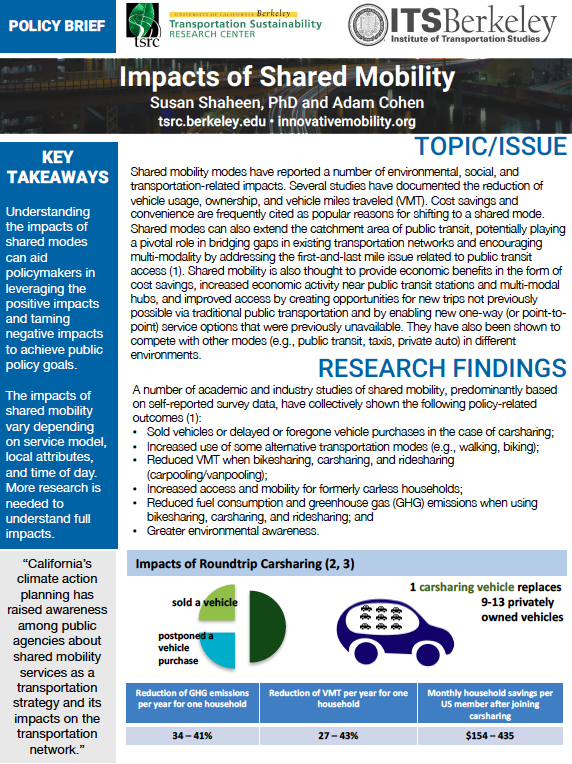 This project is a two-year evaluation of pricing/incentives applied to the one-way, all electric carsharing system operated by car2go in San Diego, CA. This system is the only electric vehicle-based, one-way carsharing system with instant access (i.e., accessible without reservation) operating in the U.S. The goal of this project is to work with car2go and the San Diego region to develop and evaluate pricing/incentive structures for their members, which improve system operational efficiency (vehicle redistribution, state-of-charge management, use of vehicles placed at public transit stations) and encourage shared-vehicle use. 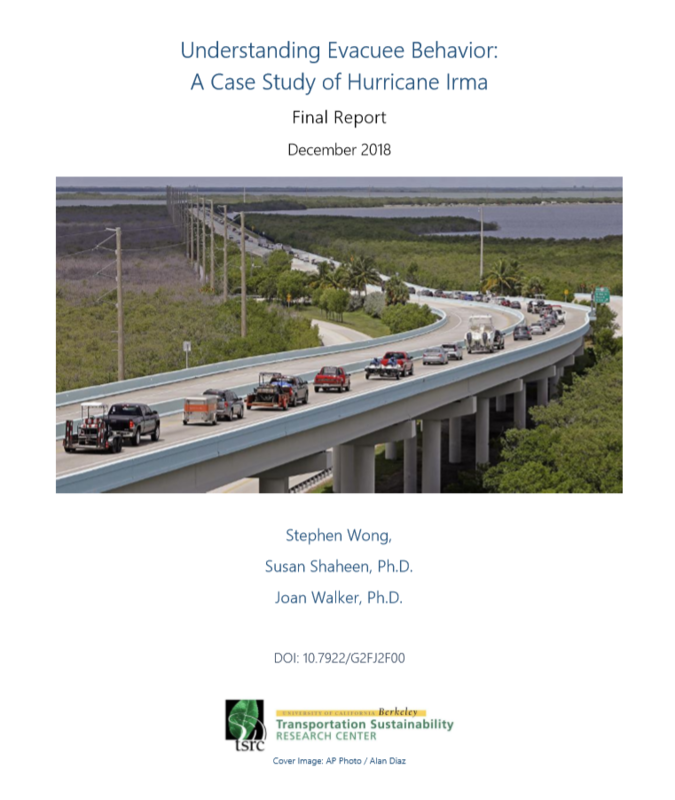 Read “Understanding Evacuee Behavior: A Case Study of Hurricane Irma” by Stephen Wong; Susan Shaheen, PhD; and Joan Walker, PhD. In September 2017, Hurricane Irma prompted one of the largest evacuations in U.S. history of over six million people. This mass movement of people, particularly in Florida, required considerable amounts of public resources and infrastructure to ensure the safety of all evacuees in both transportation and sheltering. Given the extent of the disaster and the evacuation, Hurricane Irma is an opportunity to add to the growing knowledge of evacuee behavior and the factors that influence a number of complex choices that individuals make before, during, and after a disaster. At the same time, emergency management agencies in Florida stand to gain considerable insight into their response strategies through a consolidation of effective practices and lessons learned. To explore these opportunities, we distributed an online survey (n = 645) across Florida with the help of local agencies through social media platforms, websites, and alert services. Areas impacted by Hurricane Irma were targeted for survey distribution. The survey also makes notable contributions by including questions related to reentry, a highly under-studied aspect of evacuations. To determine both evacuee and non-evacuee behavior, we analyze the survey data using descriptive statistics and discrete choice models. We conduct this analysis across a variety of critical evacuation choices including decisions related to evacuating or staying, departure timing, destination, evacuation shelter, transportation mode, route, and reentry timing. 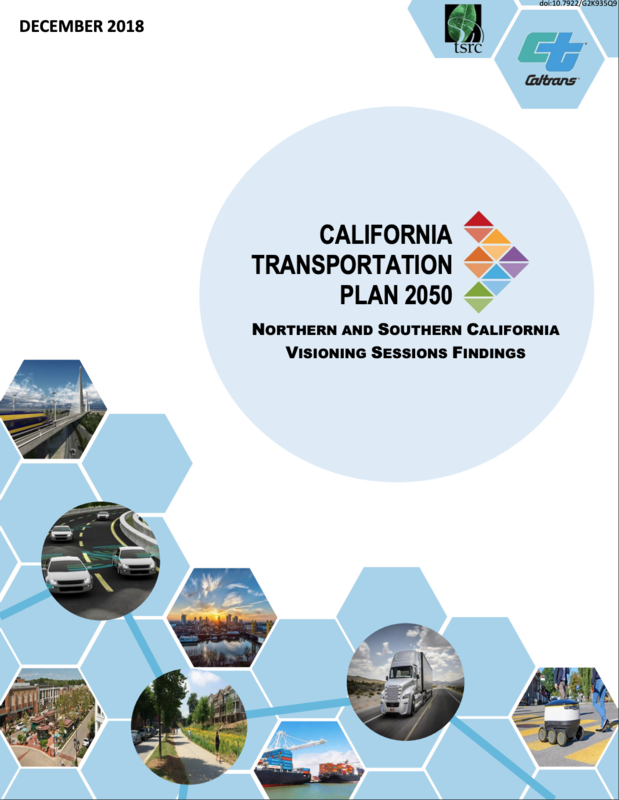 Read “California Transportation Plan 2050: Northern and Southern California Visioning Sessions Findings” by Susan Shaheen, PhD, Hannah Totte, and Adam Cohen. 3. Translating high-level policy and investment suggestions into actionable items. 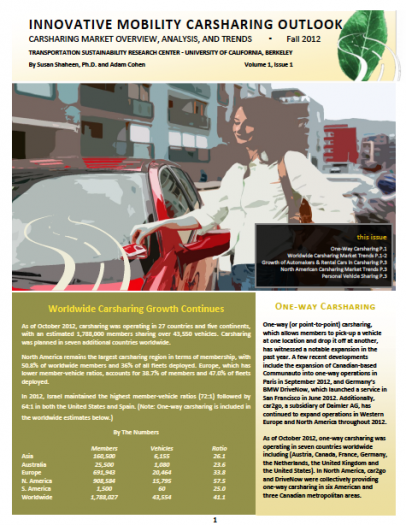 Read “The Benefits of Carpooling” by Susan Shaheen, PhD, Adam Cohen, and Alexandre Bayen. Carpooling allows travelers to share a ride to a common destination and can include several forms of sharing a ride, such as casual carpooling and real-time carpooling. 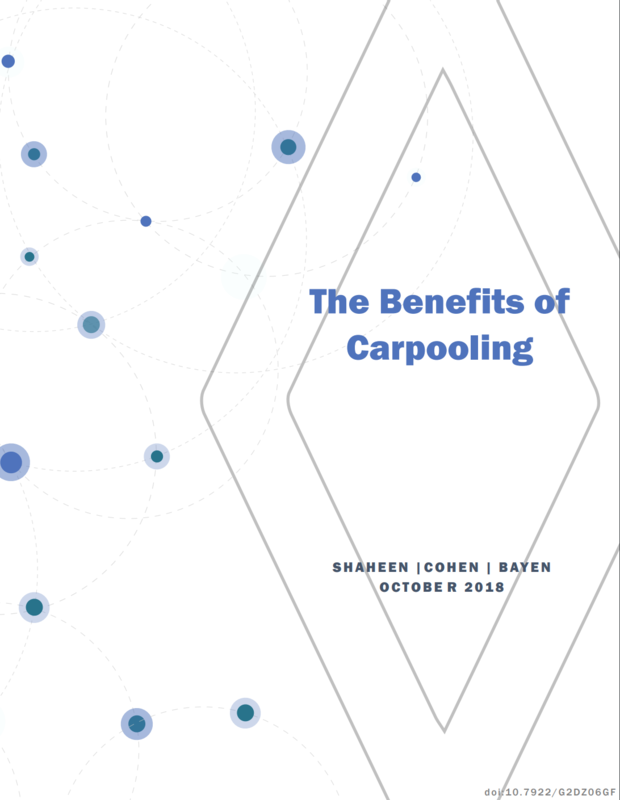 Because carpooling reduces the number of automobiles needed by travelers, it is often associated with numerous societal benefitsincluding: 1) reductions in energy consumption and emissions, 2) congestion mitigation, and 3) reduced parking infrastructure demand. In recent years, economic, environmental, and social forces coupled with technological innovations are encouraging shared and pooled services. Shared mobility is changing how people travel and is having a transformative impact on mobility. 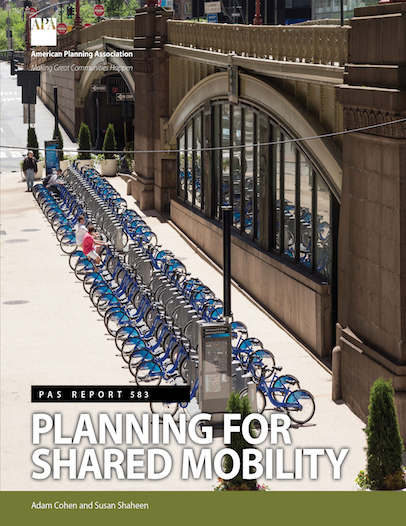 This chapter reviews key trends impacting the mobility marketplace including the growth of shared mobility and key demographic indicators, such as an aging population and Millennials entering the workforce. For decades, carpooling has been used as a strategy by numerous public agencies and employers as a strategy to address a range of climate, environmental, and congestion mitigation goals, while simultaneously increasing roadway and parking capacity. This chapter discusses how employers and public agencies can support carpooling. This chapter concludes with a summary of key findings from the report. 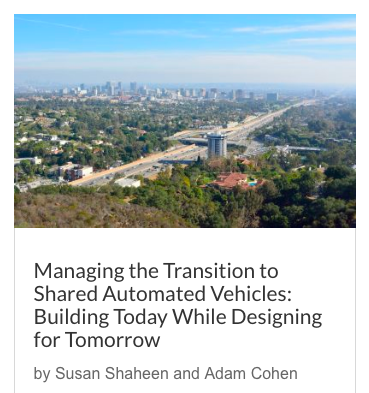 Read “Managing the Transition to Shared Automated Vehicles: Building Today While Designing for Tomorrow” by Susan Shaheen, PhD and Adam Cohen in Meeting of the Minds. 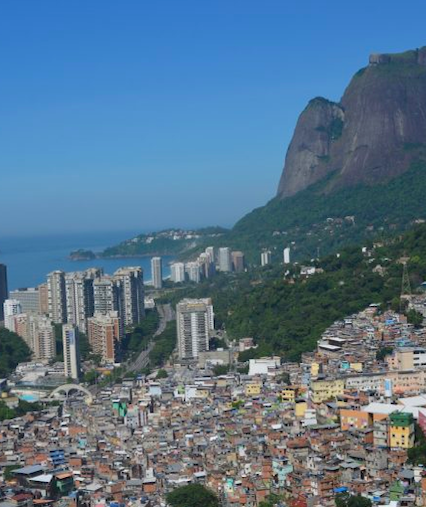 The density of urban centers is likely to increase. Suburban and exurban areas are likely to expand. A reduction in parking is likely. 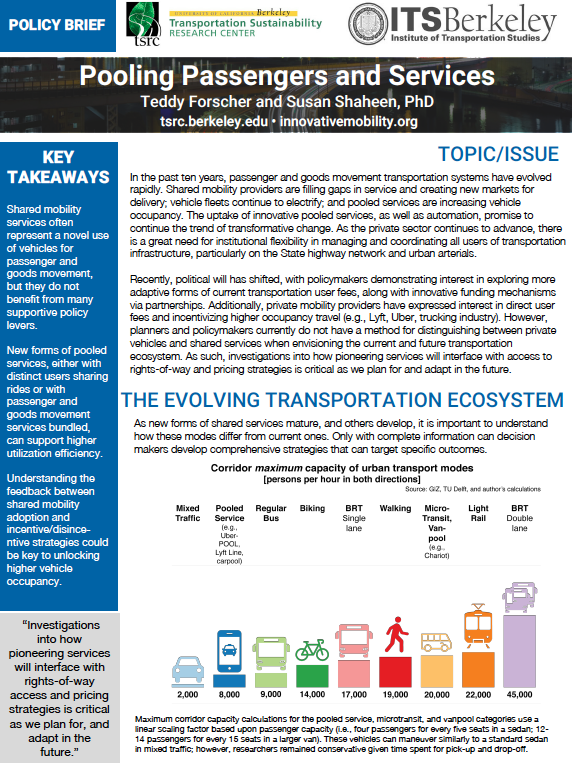 Read “Big Data, Automation, and the Future of Transportation” by Susan Shaheen, PhD, and Adam Cohen in Meeting of the Minds. In recent years, a variety of forces (economic, environmental, and social) have quickly given rise to “shared mobility,” a collective of entrepreneurs and consumers leveraging technology to share transportation resources, save money, and generate capital. Bikesharing services, such as BCycle, and business-to-consumer carsharing services, such as Zipcar, have become part of a sociodemographic trend that has pushed shared mobility from the fringe to the mainstream. The role of shared mobility in the broader landscape of urban mobility has become a frequent topic of discussion. Shared transportation modes—such as bikesharing, carsharing, ridesharing, ridesourcing/transportation network companies (TNCs), and microtransit—are changing how people travel and are having a transformative effect on smart cities. 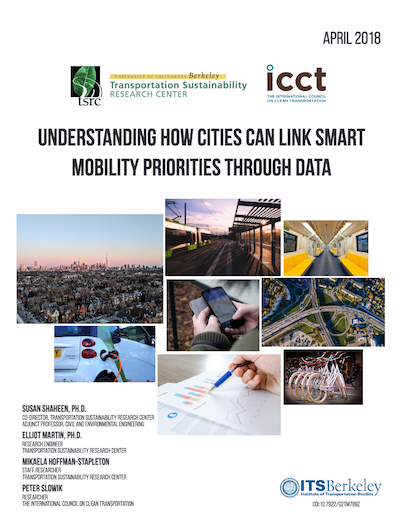 Read “Understanding How Cities Can Link Smart Mobility Priorities Through Data” by Susan Shaheen, PhD, Elliot Martin, PhD, Mikaela Hoffman-Stapleton, and Peter Slowik. This white paper presents a generalized evaluation framework that can be used for assessing project impacts within the context of transportation-related city projects. In support of this framework, we discuss a selection of metrics and data sources that are needed to evaluate the performance of smart city innovations. 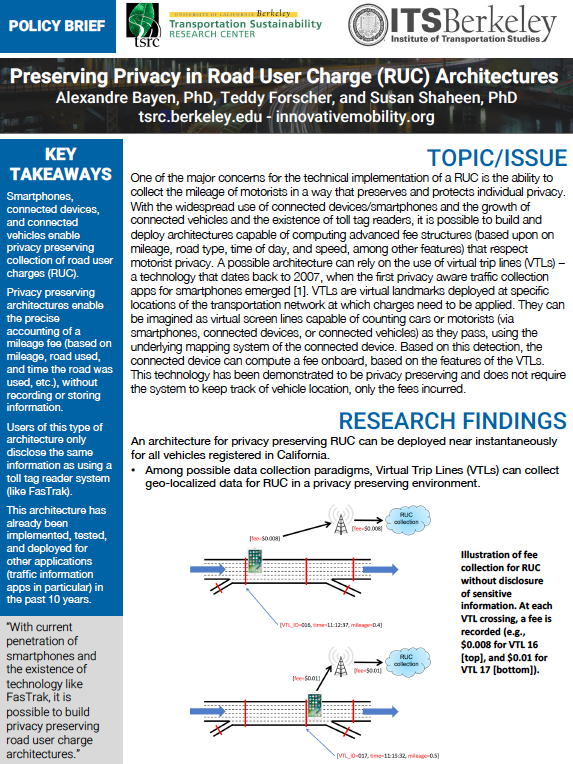 We first present a collection of projects and applications from near-term smart city concepts or actual pilot projects underway (i.e., Smart City Challenge, Federal Transit Administration (FTA) Mobility on Demand (MOD) Sandbox, and other pilot projects operating in the regions of Los Angeles, Portland, and San Francisco). These projects are identified and explained in Section 2 of this report. Using these projects as the basis for hypothetical case studies, we present selected metrics that would be necessary to evaluate and monitor the performance of such innovations over time. We then identify the data needs to compute those metrics and further highlight the gaps in known data resources that should be covered to enable their computation. The objective of this effort is to help guide future city planners, policy makers, and practitioners in understanding the design of key metrics 3 and data needs at the outset of a project to better facilitate the establishment of rigorous and thoughtful data collection requirements. 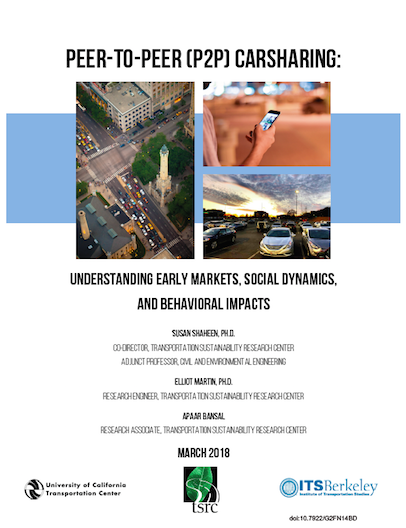 Read “Peer-To-Peer (P2P) Carsharing: Understanding Early Markets, Social Dynamics, and Behavioral Impacts” by Susan Shaheen, PhD, Elliot Martin, PhD, and Apaar Bansal. Shared mobility services have now become firmly integrated into urban transportation systems across the globe. Carsharing, bikesharing, ridesourcing or transportation network companies (TNCs), and other systems now offer urban travelers access to transportation services that had long been previously only possible through personal vehicle ownership. Carsharing is arguably the pioneer mode of the sharing economy, given it ushered in a new way of thinking and access to the private automobile in the 20th century. Since its North American inception in Montreal in 1994, carsharing has undergone several waves of innovation. 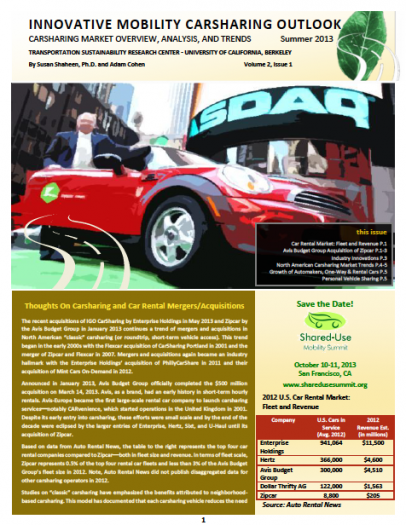 With each innovation, carsharing has deployed new functionality, technology, and business models. 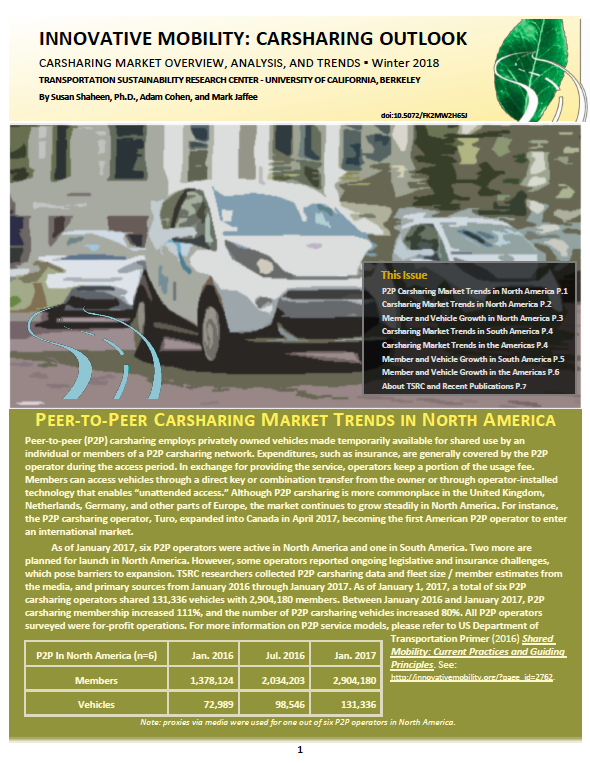 One of the more prominent innovations in carsharing has been peer-to-peer (P2P) carsharing, which enables individuals to leverage information technology to share their personal vehicles with others in their area. 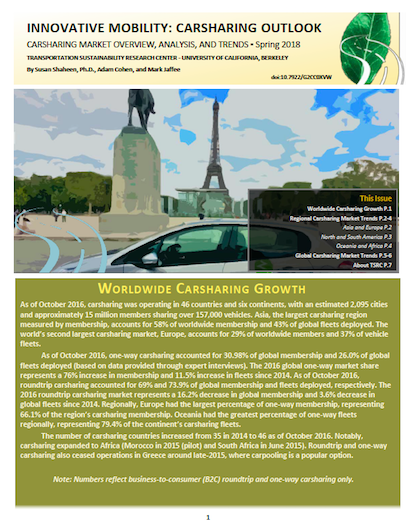 The P2P carsharing industry has gone through some evolution of its own since its initial establishment. 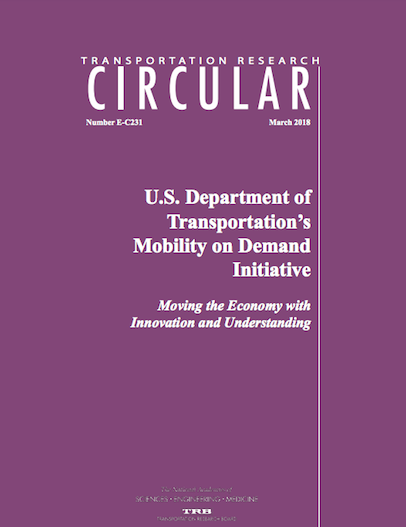 Read “Transportation Research Circular: U.S. Department of Transportation’s Mobility on Demand Initiative” by Susan Shaheen, PhD, Adam Cohen, and Elliot Martin, PhD. The market for personal mobility is changing rapidly due to shifting social and cultural trends, as well as technological advances such as smartphones, information processing, and widespread data connectivity. 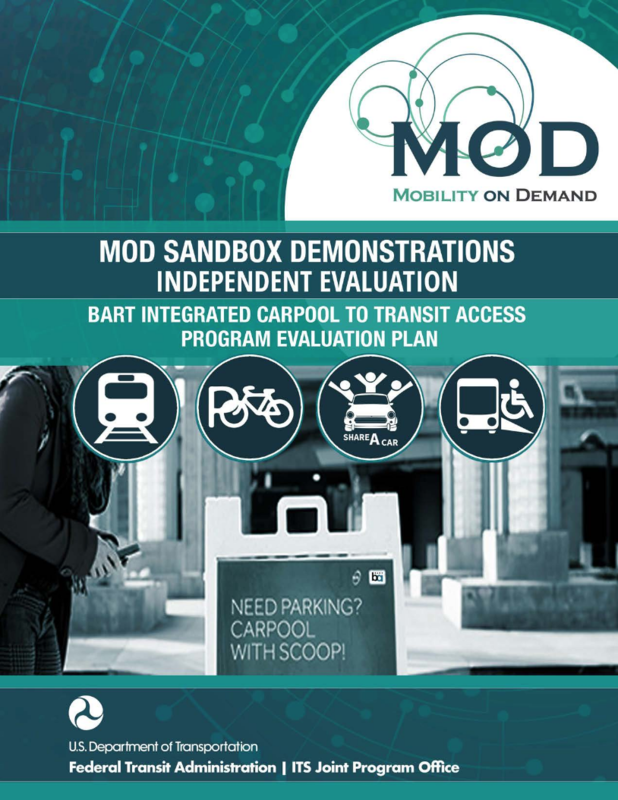 Mobility on Demand (MOD) is an innovative transportation concept. On the supply side, transportation providers manage mobility rather than traffic through demand-responsive service, shifting use to alternate modes. On the demand side, mobility consumers reserve, dispatch, or use innovative mobility, public transportation, and goods delivery strategies in place of privately owned vehicles. 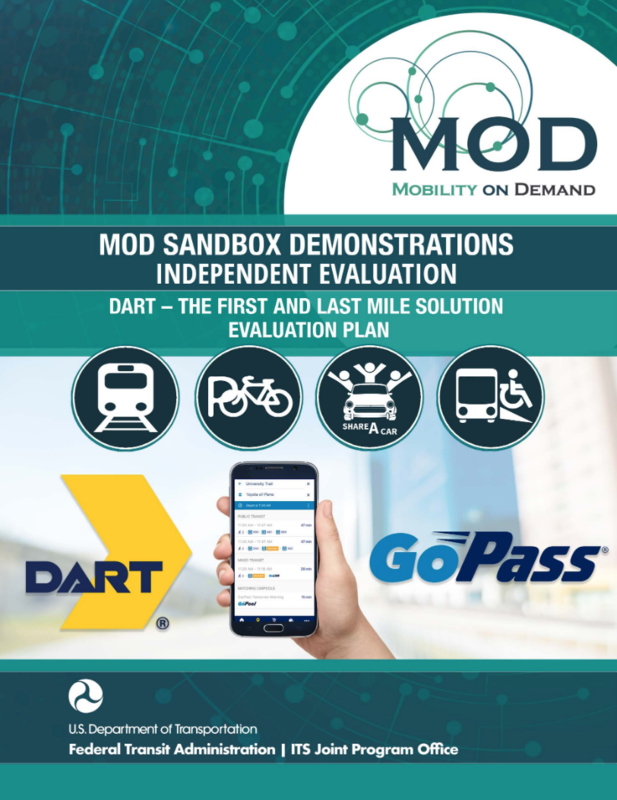 The most-advanced forms of MOD incorporate trip planning and booking, real-time information, and fare payment into a single-user interface. Modes facilitated through MOD providers can include carsharing, bikesharing, ridesharing, ridesourcing, or transportation network companies (TNCs), scooter sharing, microtransit, shuttle services, public transportation, and other emerging transportation solutions. 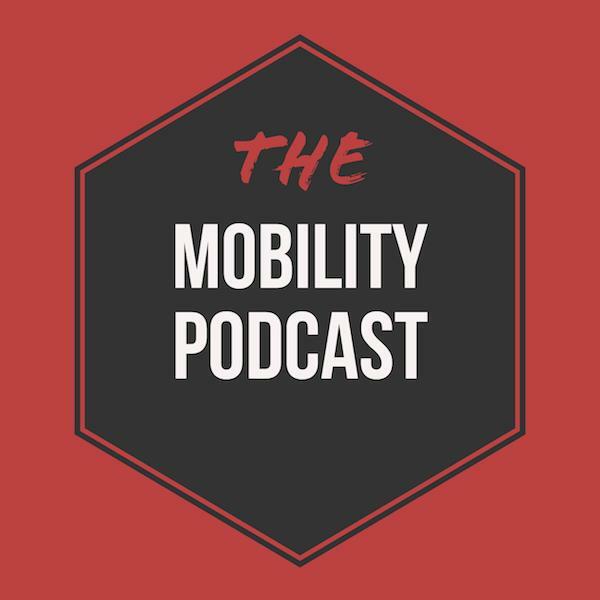 Listen to “The Mobility Podcast” with Susan A. Shaheen, as she discusses the recent report: “Travel Behavior: Shared Mobility and Transportation Equity.” This episode was recorded live at the Next Urbanism Conference, in Portland, OR. 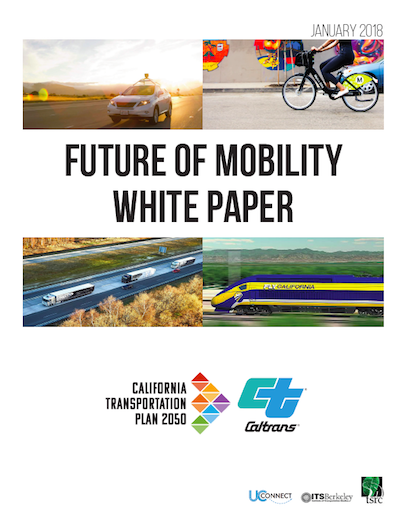 Read “Future of Mobility White Paper” as part of CALTRANS California Transportation Plan 2050, by Susan Shaheen, PhD, Hannah Totte, and Adam Stocker. Transportation is arguably experiencing its most transformative revolution since the introduction of the automobile. Concerns over climate change and equity are converging with dramatic technological advances. Although these changes – including shared mobility and automation – are rapidly altering the mobility landscape, predictions about the future of transportation are complex, nuanced, and widely debated. 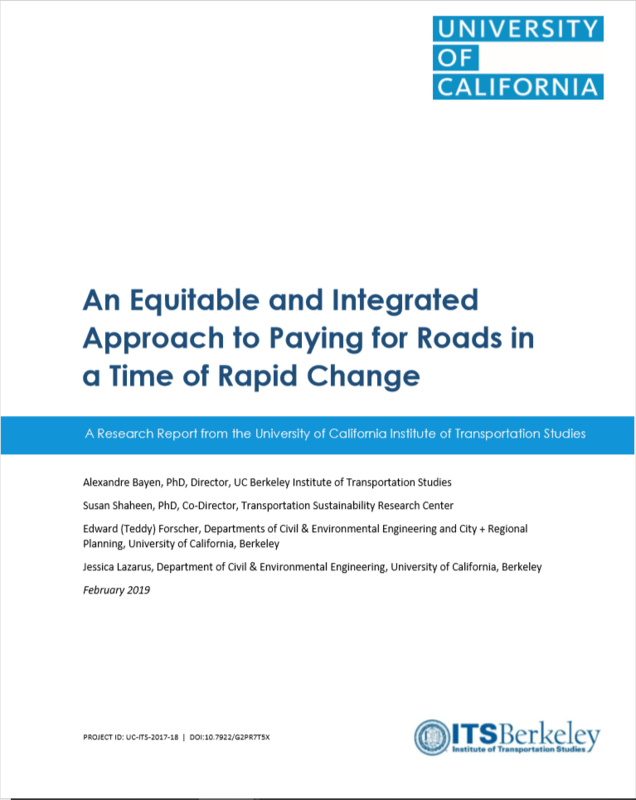 California is required by law to renew the California Transportation Plan (CTP), updating its models and policy considerations to reflect industry changes every five years. This document is envisioned as a reference for modelers and decision makers. We aggregate current information and research on the state of key trends and emerging technologies/services, documented impacts on California’s transportation ecosystem, and future growth projections (as appropriate). 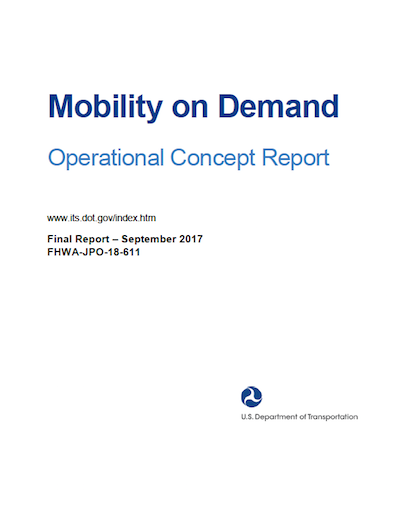 Read “Mobility on Demand: Operational Concept Report” by Susan Shaheen, PhD, Adam Cohen, Balaji Yelchuru, and Sara Sarkhili. This operational concept report provides an overview of the Mobility on Demand (MOD) concept and its evolution, description of the MOD ecosystem in a supply and demand framework, and its stakeholders and enablers. Leveraging the MOD ecosystem framework, this report reviews the key enablers of the system including business models and partnerships, land use and different urbanization scenarios, social equity and environmental justice, policies and standards, and enabling technologies. This review is mostly focused on the more recent forms of MOD (e.g., shared mobility). 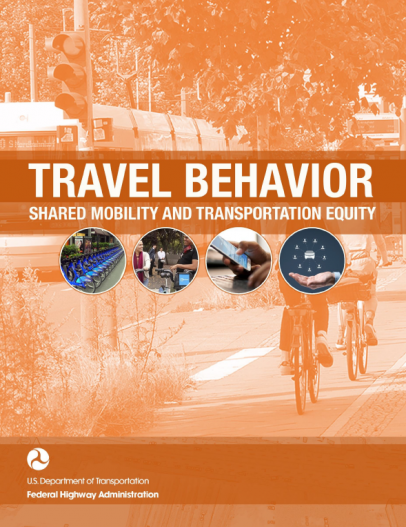 Read “Travel Behavior: Shared Mobility and Transportation Equity” by Susan Shaheen, PhD, Corwin Bell, Adam Cohen, and Balaji Yelchuru. 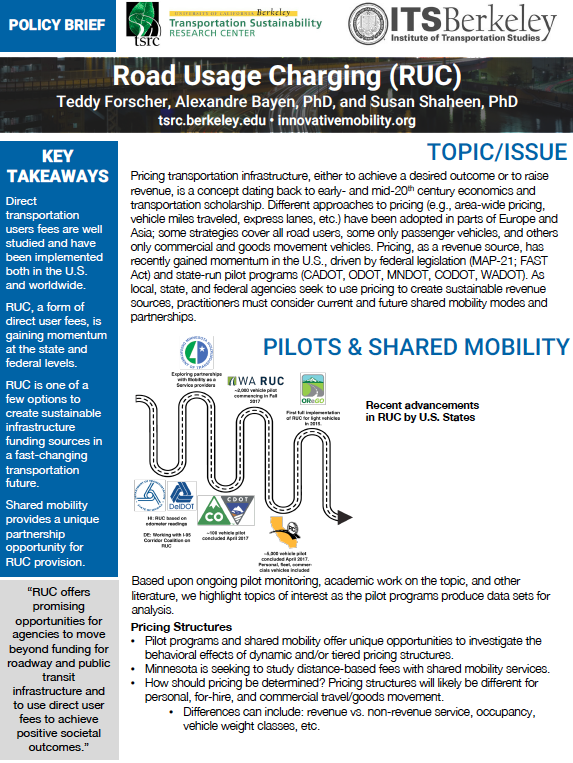 Shared mobility—the shared use of a motor vehicle, bicycle, or other low-speed transportation mode that allows users to obtain short-term access to transportation on an as-needed basis—has the potential to help address some transportation equity challenges. In an effort to categorize the myriad of transportation equity barriers facing transportation system users, this primer proposes a ‘STEPS to Transportation Equity’ framework including: Spatial, Temporal, Economic, Physiological, and Social barriers. For each barrier category, shared mobility opportunities and challenges are explored along with policy recommendations. 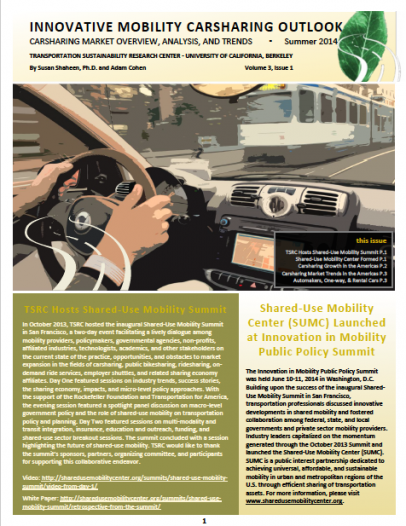 Read “Shared Mobility: Current Practices and Guiding Principles” by Susan Shaheen, PhD, Adam Cohen, and Ismail Zohdy. 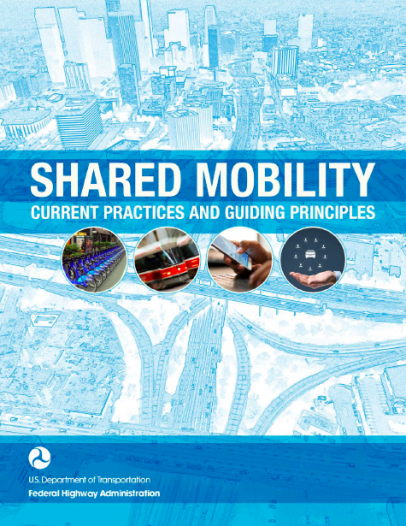 This primer provides an introduction and background to shared mobility; discusses the government’s role; reviews success stories; examines challenges, lessons learned, and proposed solutions; and concludes with guiding principles for public agencies. 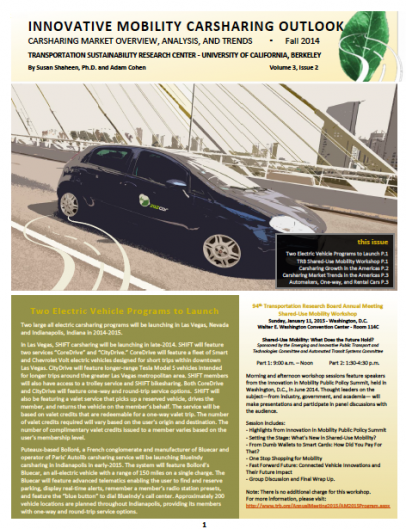 The primer provides an overview of current practices in this emerging field, and it also looks toward the future in the evolution and development of shared mobility. 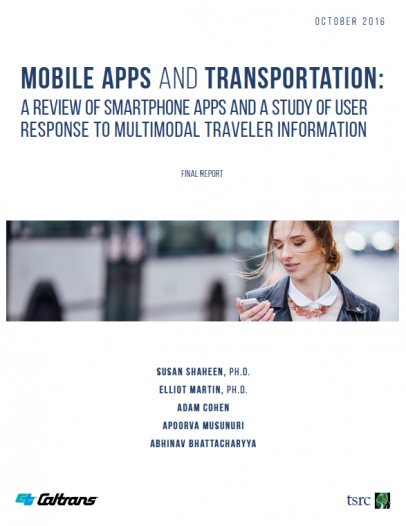 Read “Mobile Apps and Transportation: A Review of Smartphone Apps and a Study of User Response to Multimodal Traveler Information” by Susan Shaheen, PhD, Elliot Martin, PhD, Adam Cohen, Apoorva Musunuri, and Abhinav Bhattacharyya. travel behavior, and modal shift. 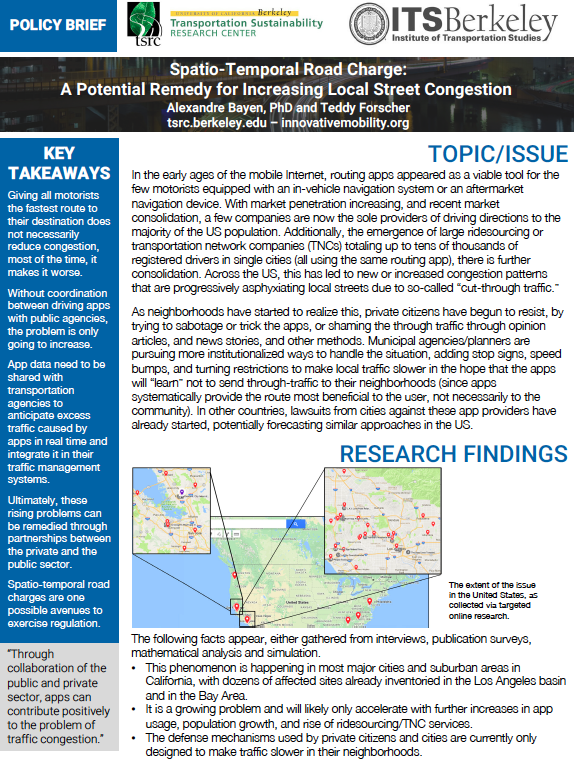 The goal was to enhance understanding of how the multimodal apps were impacting the transportation behavior. The survey did found that respondents used multimodal apps in ways that yielded travel that was less energy intensive and more supportive of public transit. 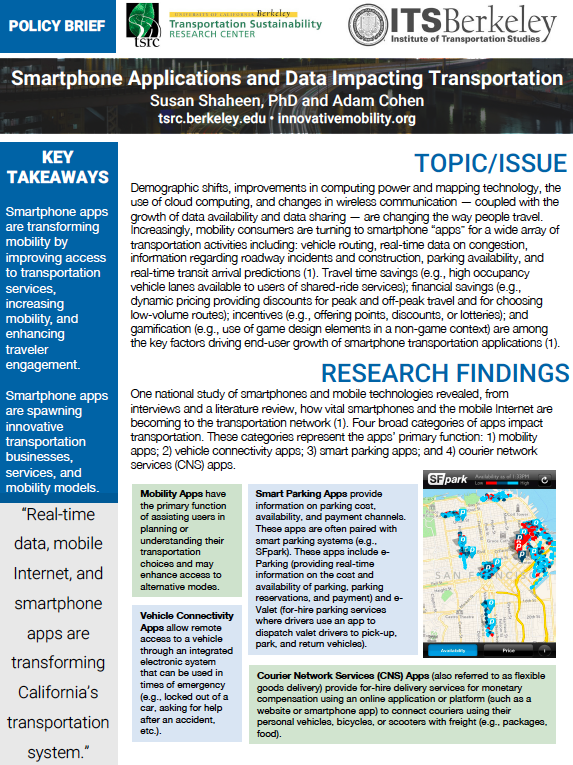 Looking to the future, smartphone applications and more specifically multimodal aggregators, may offer the potential for transportation planners and policymakers to enhance their understanding of multimodal travel behavior, share data, enhance collaboration, and identify opportunities for public-private partnerships. 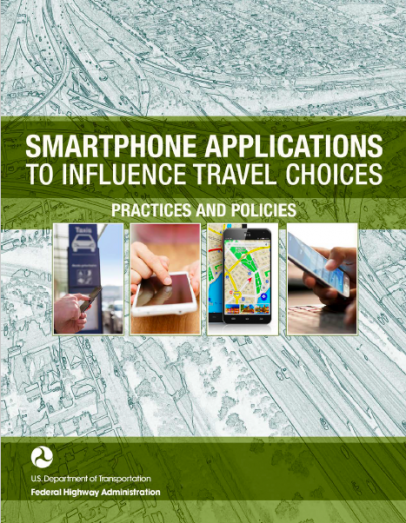 Read “Smartphone Applications to Influence Travel Choices: Practices and Policies” by Susan Shaheen, PhD, Adam Cohen, Ismail Zohdy, and Beaudry Kock. 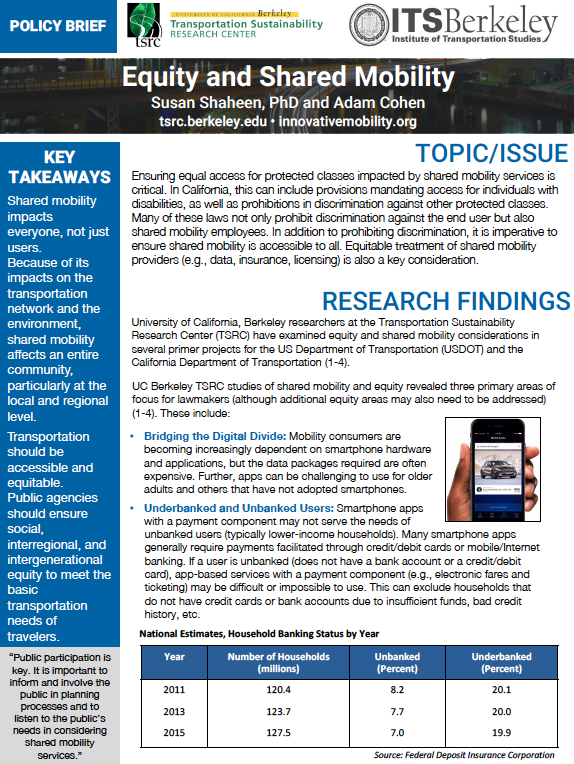 Read “Shared Mobility: Definitions, Industry Developments, and Early Understanding” by Susan Shaheen, PhD, Nelson Chan, Apaar Bansal, and Adam Cohen. 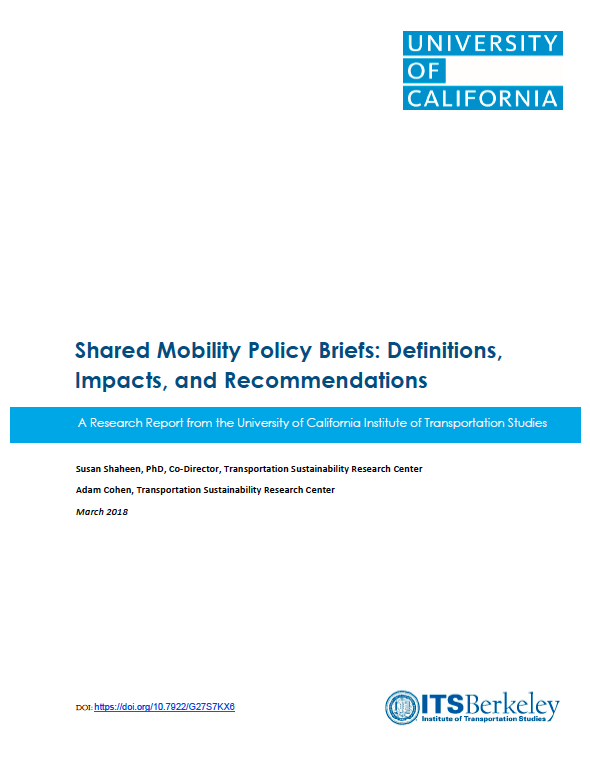 This white paper includes an introduction and background to different types of shared modes, as well as smartphone-based trip planning apps that can facilitate access to public transit and shared mobility services. 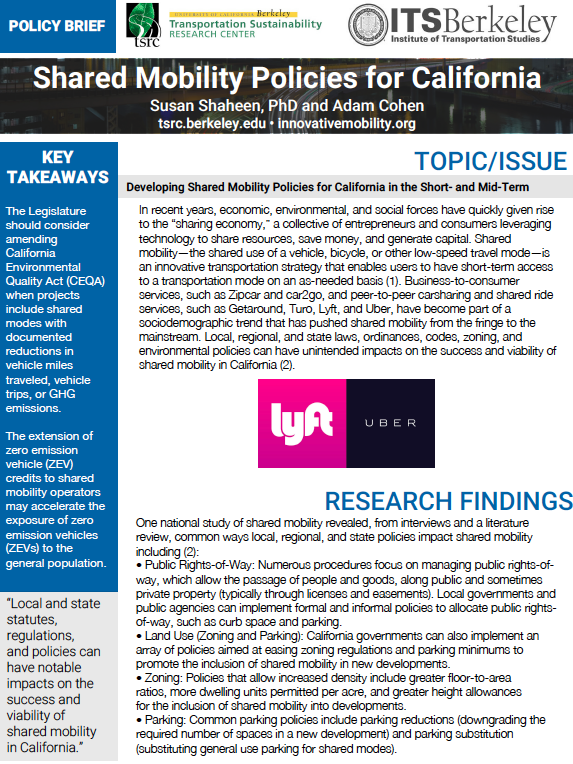 This paper also notes where potential benefits of shared mobility could align with the new mission of the California Department of Transportation (Caltrans), which is to “Provide a safe, sustainable, integrated, and efficient transportation system to enhance California’s economy and livability.” We conclude the paper with a summary and provide an appendix with a glossary of terms and a list of the shared mobility models, including a range of companies in each sector. 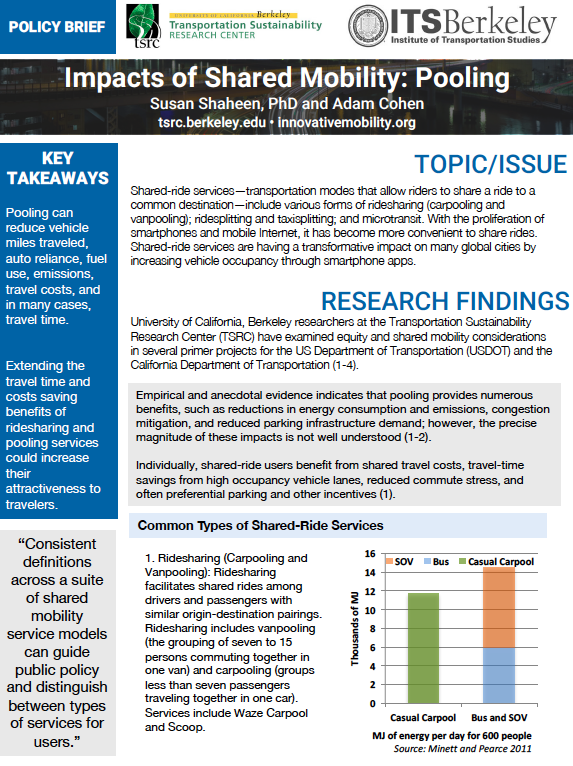 Read “Shared Mobility: Retrospective from Caltrans Shared Mobility Workshop” by Susan Shaheen, PhD, Adam Stocker, and Apaar Bansal. 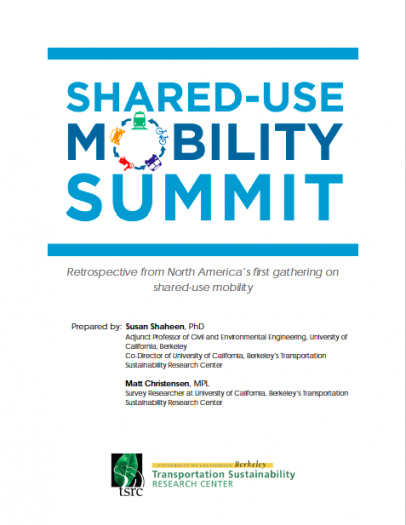 Read “Shared-Use Mobility Summit: Retrospective from North America’s first gathering on shared-use mobility” by Susan Shaheen, PhD, and Matt Christensen. 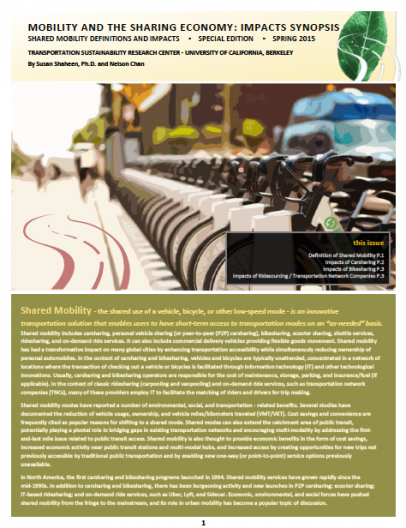 Shared-use mobility-the shared use of a vehicle, bicycle or other low-speed mode-is an innovative transportation solution that enables users to have short-term access to a transportation mode. 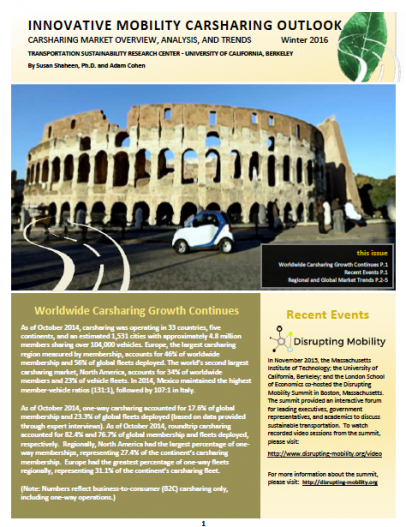 In North America, shared-use mobility encompasses the submarkets of carsharing, bikesharing, ridesharing, on-demand ride services, scooter sharing, shuttle services, and other emerging industries. 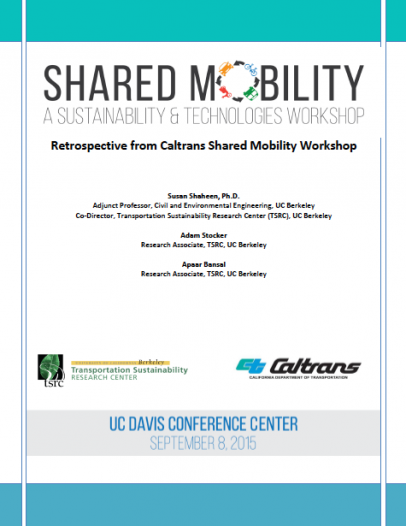 In October 2013, the University of California, Berkeley’s Transportation Sustainability Research Center (TSRC) hosted the inaugural Shared-Use Mobility Summit in San Francisco, California. The summit was a two-day event that facilitated a dialogue among nearly 300 participants representing close to 200 organizations. Participants included mobility providers, policymakers, governmental agencies, non-profits, technologists, academics, media, other stakeholders, and affiliated industries. One hundred and five (105) private companies attended the summit, and 62 governmental agencies were represented at the summit. Additionally, 44 academics from 17 universities participated. Of the 194 organizations represented, 26 were affiliated with carsharing, 16 with bikesharing, and 6 were associated with ridesharing and ondemand ride services or transportation network companies (TNCs). 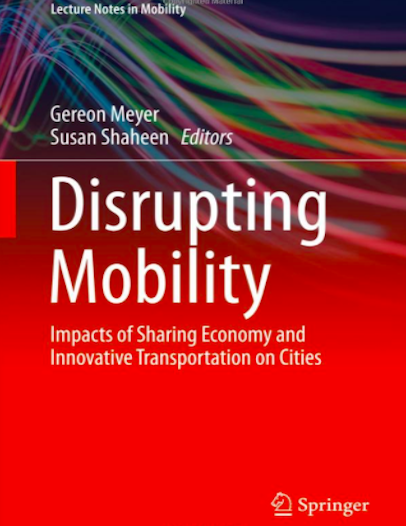 Read “Disrupting Mobility: Impacts of Sharing Economy and Innovative Transportation on Cities,” edited by Susan Shaheen, PhD, and Gereon Meyer. 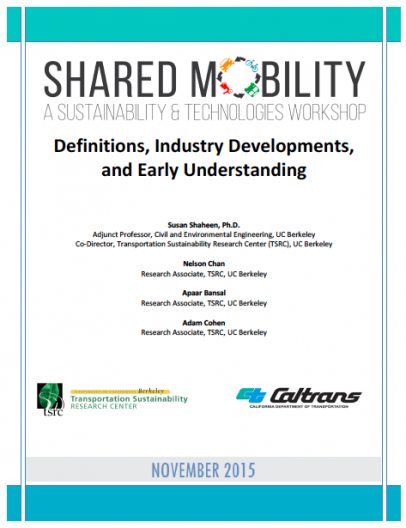 Read “Planning for Shared Mobility” by Susan Shaheen, PhD, and Adam Cohen. In recent years, economic, environmental, and social forces have quickly given rise to the “sharing economy,” a collective of entrepreneurs and consumers leveraging technology to share resources, save money, and generate capital. Homesharing services, such as Airbnb, and peer-to-peer carsharing services, such as Getaround, have become part of a sociodemographic trend that has pushed the sharing economy from the fringe and more to the mainstream. The role of shared mobility in the broader landscape of urban mobility has become a frequent topic of discussion. Major shared transportation modes—such as bikesharing, carsharing, ridesourcing, and alternative transit services—are changing how people travel and are having a transformative effect on mobility and local planning. 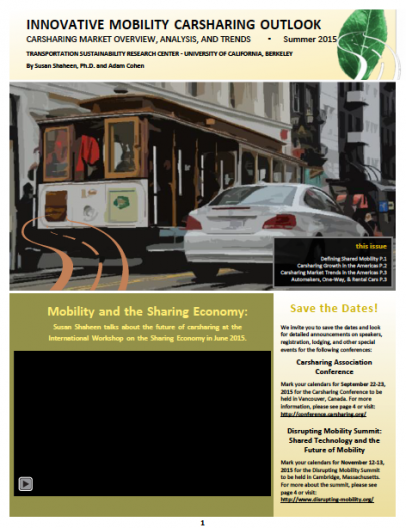 Read “Mobility and the Sharing Economy: Impacts Synopsis” by Susan Shaheen, PhD, and Nelson Chan. Shared Mobility – the shared use of a vehicle, bicycle, or other low-speed mode – is an innovativetransportation solution that enables users to have short-term access to transportation modes on an “as-needed” basis. Shared mobility includes carsharing, personal vehicle sharing (or peer-to-peer (P2P) carsharing), bikesharing, scooter sharing, shuttle services, ridesharing, and on-demand ride services. It can also include commercial delivery vehicles providing flexible goods movement. Shared mobility has had a transformative impact on many global cities by enhancing transportation accessibility while simultaneously reducing ownership of personal automobiles. In the context of carsharing and bikesharing, vehicles and bicycles are typically unattended, concentrated in a network of locations where the transaction of checking out a vehicle or bicycles is facilitated through information technology (IT) and other technological innovations. Usually, carsharing and bikesharing operators are responsible for the cost of maintenance, storage, parking, and insurance/fuel (if applicable). In the context of classic ridesharing (carpooling and vanpooling) and on-demand ride services, such as transportation network companies (TNCs), many of these providers employ IT to facilitate the matching of riders and drivers for trip making. 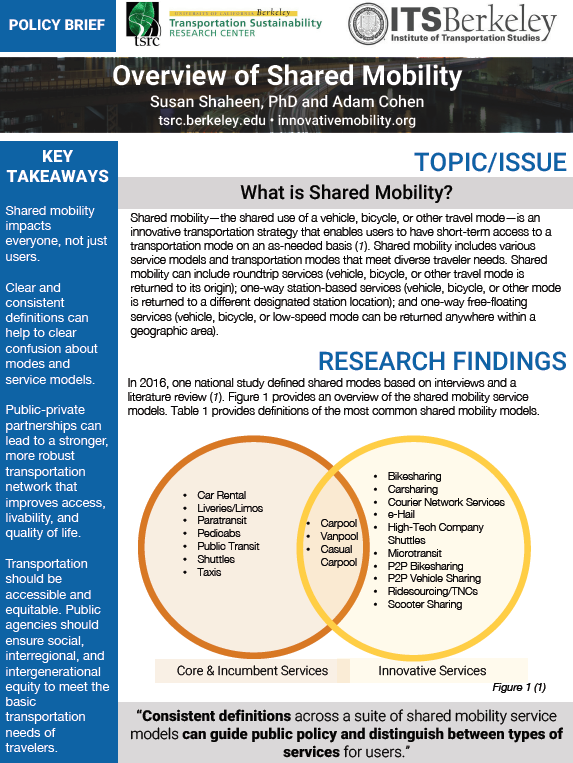 Read “Shared Mobility: Current Practices and Guiding Principles – Glossary” by Susan Shaheen, PhD, and Adam Cohen. 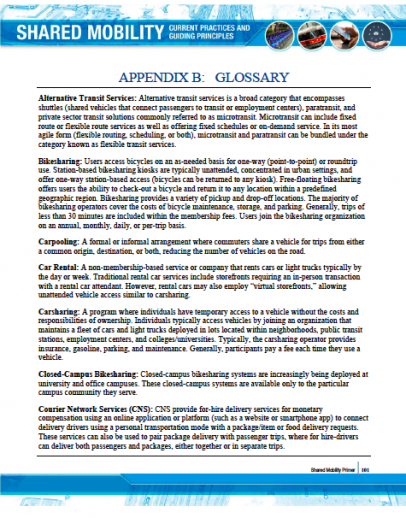 Includes definitions for: Alternative Transit Services, Bikesharing, Carpooling, Car Rental, Carsharing, Closed-Campus Bikesharing, Courier Network Services, E-Hail Apps, High-Tech Company Shuttles, Fixed Route and Fixed Schedule Microtransit, Flexible Route and On-Demand Schedule Microtransit, Flexible Transit Services, Fractional Ownership, Hybrid Peer-to-Peer, Limousines and Liveries, Microtransit, One-Way Carsharing, Paired On-Demand Passenger Ride and Courier Services, Pedicabs, Peer-to-Peer Access Model, Peer-to-Peer Carsharing, Peer-to-Peer Marketplace, Personal Vehicle Sharing, Public Transportation, Peer-to-Peer Bikesharing, Transportation Network Company/Ridesourcing, Ride-Hailing, Ridesplitting, Rountrip Carsharing, Scooter Sharing, Slugging, Taxis, and Vanpooling. Explore IMR’s YouTube Channel, with keynote addresses, panel discussions, and other academic and industry gatherings.